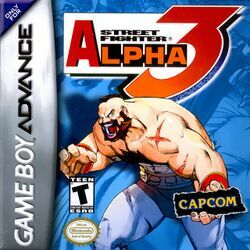 Known as Street Fighter Zero 3 Upper in Japan, this is an upgraded version of Street Fighter Alpha 3 for the Game Boy Advance (Street Fighter Zero 3 Upper is the same name used for the reverse port from the Sega Dreamcast version of SFA3 to the arcade in Japan). In addition to making a very successful adaptation to the GBA, Crawfish Interactive saw fit to add three Capcom characters that recently appeared in Capcom vs. SNK to the SFA3 roster. Due to memory size restrictions, the World Tour mode found in hone console conversion of SFA3 was removed, but the ISM Plus upgrades were kept and can be unlocked by fulfilling certain conditions. This page was last edited on 13 August 2010, at 22:09. This page has been accessed 63,882 times.